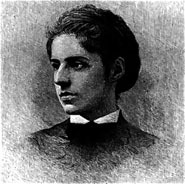 The daughter of Sephardic Jews whose ancestors settled in New York in the colonial period, Emma Lazarus was a writer and a scholar of literature and languages. Even before Zionism became a cohesive movement, Lazarus's poetry and essays protested the rise of antisemitism and called on Jews to create a homeland in Palestine. "Give me your tired, your poor, / Your huddled masses yearning to breathe free" are two famous lines of her sonnet, "The New Colossus," which was affixed to the Statue of Liberty in 1903. Lazarus was at the peak of her career when she died of cancer in 1887, at the age of 38.